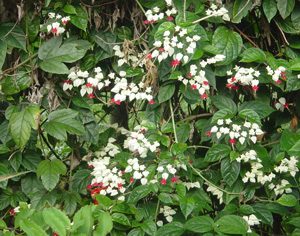 Clerodendrum, sometimes misspelled clerodendron, comes in several variations. 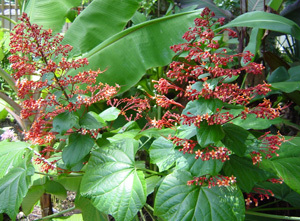 My favorite is C. paniculatum known as Pagoda Flower due to its pagoda shaped cluster of red/orange blooms on top. This plant is fast growing and is easily propagated from seed, cuttings or runners. 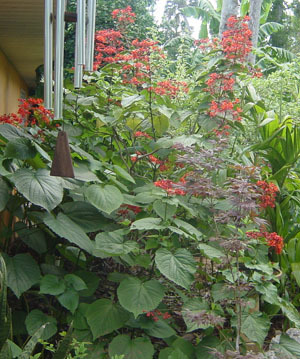 It grows well in full sun or part shade, reaching up to 6 feet tall. At the end of the season, cut back to 1 or 2 feet from the ground and remove the suckers or runners as desired. The suckers can be potted to share with others. It also does well as a container plant inside or out. It originated in China and Southeast Asia. C. speciosissimum known as Glorybower or Java Glorybower is another favorite in my garden. These are easy plants to grow in warm climates where they come back year after year. They add a much admired burst of brilliant red/orange color through the summer and fall. There are many more cultivars that offer various other colors. C. thomsoniae is known as Bleeding Heart Vine or Bag Flower and grows as a vine rather than a bush like the other varieties. The name comes from the clusters of white or pink heart shaped blooms with red petals beneath each heart. Propagate from cuttings, seeds or runners. Also known as Scarlet Kiss. It's able to withstand light freezing. C. quadriloculare is known as Fireworks, Starburst Bush or Shooting Star due to the starburst arrangement of pink tubes ending with a spray of creamy white blooms. Each spray is rather large. This plant grows as either a large bush or small tree 12 to 15 feet tall. It is sometimes considered invasive.